A top floor 2 bedroom spacious suite with brand new decor and furnishings throughout. Modern, homely feel throughout with a bespoke wooden breakfast bar with 6 stools. The suite has an En-Suite shower room with a modern chrome shower, wash basin and toilet. There is also a brand new open plan kitchenette ( with oven, hob, fridge, microwave, kettle and toaster).This suite is suitable for families and groups of friends ( up to 6 persons). This bedroom has 6ft super king zip and link bed (easily transformed into two comfortable single beds) with 2 bedside tables and 2 wall reading lamps, free standing wardrobe and bespoke wooden shelving built into the alcove for extra clothes storage. Bedroom Two has double bed, bespoke wooden wardrobe built into the alcove, 2 bedside tables and 2 wall mounted reading lamps. 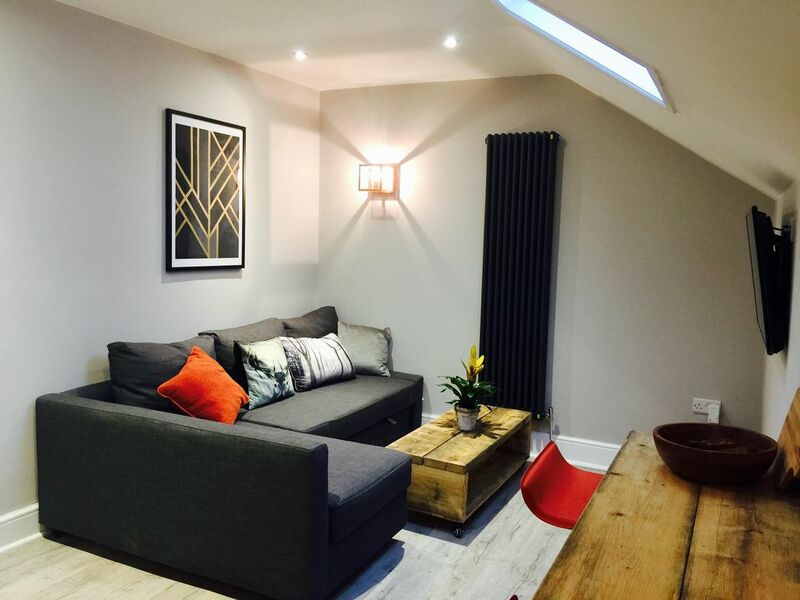 There is a comfortable double sofa bed in the lounge area and bespoke coffee table. The suite is fully fitted with high speed wifi, 40 inch flatscreen smart TV's (including Netflix and BBC and ITV player). All of the furnishings and decor are brand new and the Kipling suite has a modern, cosy family feel. There is box full of toys and books available. There is a laundry room available for all guests in the basement of the property, which has 2, 10kg washing machines and 2 brand new dryers. There is a brand new open plan kitchenette (with oven, hob, fridge, microwave, kettle and toaster). This kitchenette is a part of lounge. Dining area is a part of lounge. There is a bespoke wooden breakfast bar with 6 stools.